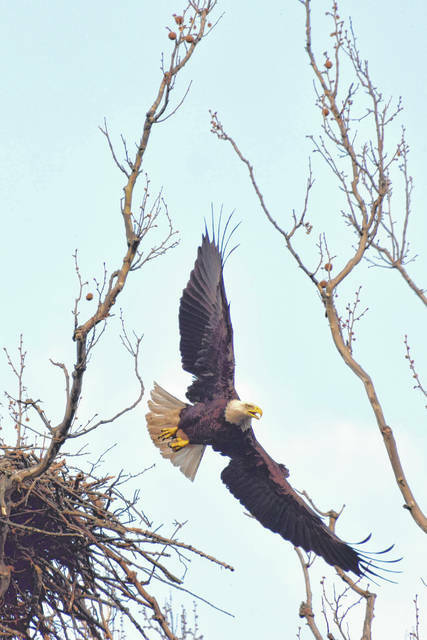 Eagle flying from the nest at Highbanks on April 29, 2015. If you’re preparing for a race or starting a running routine, the trails in your Metro Parks are a great place to start. I’ve trained for 5Ks and a full marathon on these trails and they are the best training trails in Ohio. Highbanks has 13 miles of trails, making it the perfect park to train for a short or longer race. Each trail is different and can cater to any distance. For a hilly run, lace up your sneakers and hit the 2.5-mile Dripping Rock Trail or the 2.3-mile Overlook Trail. You can get a couple hundred feet of elevation change in less than five miles! These trails are way different than your typical flat paved trails. Although they take some practice and getting used to, the sights along the trail are worth it. If you’re looking for a less intense trail, the Multi-Use Trail is a good option. The 2.3-mile trail is mostly flat with a few hills and is paved. This is a great trail to run if you’re pushing a stroller. The Coyote Run Trail is 3.5 miles and although it can often be muddy, it’s not as hilly as the other trails. This trail meanders through meadows and wooded areas. The Big Meadows Path is a flat one-mile loop that you can run on if you’re just starting out. If you’re looking to run with your furry friend, you can run on any trail except the Dripping Rock and Overlook trails. I’ve been running at Highbanks since I started my job here four years ago. When I worked mornings, I would pack my clothes and go for a run once I finished my shift. I remember getting so lost on my first several runs, but eventually I learned the trails. Now I can easily make up routes of varied distances. I’m hooked on running, but running through the trails at Highbanks gives me a different level of peacefulness and serenity. No matter the season, the trails are always beautiful. I can tell when I haven’t been running the hills as much because the run is challenging but equally as rewarding. One of my favorite spots to stop and take in the views is the overlook deck off the Overlook Trail. The view of the Olentangy River is beautiful and there’s always the possibility of seeing a bald eagle. Keep your eyes out for the next round of Ranger Runs starting in May 2019! I’ll be leading two runs a month and the distances will build upon each run. The first run will be two miles and we’ll work our way up to five miles. Like our Facebook page to see the schedule for the upcoming Ranger Runs. This article originally appeared on the Columbus and Franklin County Metro Parks Blog. It was posted on Jan. 9.